Petite wire wrapped pendant measures just under 40mm, including ring bail. 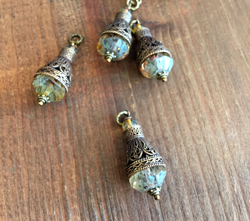 Crystal picasso bead is capped by solid brass cannetile filigree made to order for us. Perfect for statement earrings as well. Sold by the piece.